I don’t know about you, but I much prefer fasteners that involve hex keys to those that require a slotted or philips head screwdriver. 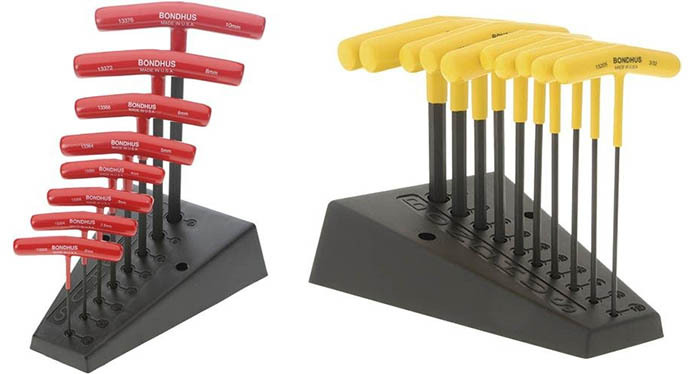 There are some very fine screwdrivers available, and we’ve written about 8 of the world’s best, but I decided it was high time to track down the world’s best T-Handled Hex Keys. Available Size Range: What’s the range of sizes available in SAE (inch) and Metric? Is there an optional Torx set available? Grip: Is there a comfortable ergonomic grip? Side Key: Does the tool have both the long reach and shorter handle side key? Color Coding and Markings: I like color coded tools. Having a different color for each system (SAE, Metric, and Torx) as well as clearly readable markings on each tool’s size is a help. Case or Stand: I hate having these things run around loose in a tool drawer. Are they providing a nice case or stand to organize my T-Handles? 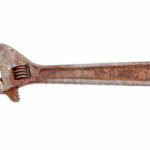 Warranty: Always an important consideration for tools. You want them to be with you forever with a maker that stands behind them. Value: This can be touchy to define, but I have come up with a system. Crowdsourced Reviews: Crowdsourcing is not the only answer, but it is a valuable input. Let’s delve into the last two, Value and Crowdsourced reviews a bit more deeply. I pulled the information off Amazon to get to Crowdsourcing. They tell you how many reviews there are, the average rating, and you can even read the reviews. As you’ll see, I did read through all the reviews for each tool, but largely the negatives, so I could put forward any consistent complaints about each tool. As for Value, I settled on the metric price per review point, with the idea that getting tools that are well rated at a lower price presents a good value. For example, a cheap tool can stand be rated a little lower and still score well. But an expensive tool had better be extremely well-reviewed, otherwise, why bother paying the high price? When I analyzed the value, I took the total price for both SAE and Metric (so you see what it costs to tool up) and divided by the average rating for both. Lastly, I list these in the order of most highly rated to lowest rating. It’s very important to look at how many reviews a tool has. Some of our highest rated tools don’t have nearly as many reviews, so we should take their ratings with a grain of salt compared to tools that have 50 or 100 reviews. Let’s dive in and look at some T-Handled Hex Keys! Nice ergonomic handles–I like the offset style better than the centered style. Just seems like I can get a little more torque on them, plus they seem like they work better when you’re using the Through-Handle side key. I like the flat cases too. They keep the tools secure, they’re easy to carry around the shop to where they’re needed, and they fit in a tool cabinet drawer. You can’t say as much for most of the stamped-metal organizers. The attention to detail on storage and the high price with no discount available are the tip-offs that Ampro tools are largely intended for industrial customers rather than individuals. They’re nice tools, but you will pay for the privilege of owning them. These German-made T-Handles are not cheap, but they did get a perfect score of 5 stars. For the full Metric + SAE lineup, you’ll be paying a cool hundred bucks at the current Amazon discount rate. For comparison, the El Cheapo Harbor Freight version is $27 for both sets. Of course, if you’re using these babies to tune up your vintage Porsche racing car, cost is no object and its worth something not to touch your baby with anything but authentic German-made tools. On the other hand, if we look at them using our value score, things look a little less crazy as they score $20.10 / Star–not the most expensive for their quality and certainly not the least either. On the other hand, there are very few reviews there to go on–looks like only the die-hard Wiha fans are buying these things. They are good-looking tools, with a comfortable soft grip handle and both the long reach ball end and the handle through key. 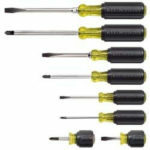 I’ve got a small set of Wiha Torx drivers for changing inserts (hate losing those tiny screws! ), and they’re very nicely made. Sizes are clearly marked and the handles are color-coded by system too. My biggest bone to pick is you don’t even get an organizer stand with them for this price–to get the set with the stand costs even more. My #2 issue is with sizes. The World’s Best should have more sizes than any others, but the set doesn’t include a 1/2″ size, although we do get a 7/64 and a 9/64 size, which are not in many of the other sets. On the metric side, Wiha doesn’t provide a 5.5 mm or a 12 mm. First thing I want to say about these Bondhus tools is they’re made in the good old U, S, of A–Yay! I like that a lot. Second thing is that whether you’re looking at Amazon or at reviews all over the Internet, the Bondhus T-Handles are probably the most popular high quality T-Handles on the market. That doesn’t mean they’re the best ones for you, but it means a whole lot of people thought they were best for them. All Bondhus® products are guaranteed for life. 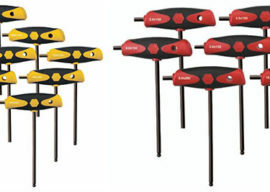 If you are not happy with a Bondhus® tool – for any reason – simply return it. A replacement will be shipped right out at no cost – no hassles, no questions asked! And the $/Star scores make these guys look like a good value. Well this set has no Through Key and no Ball Ends. 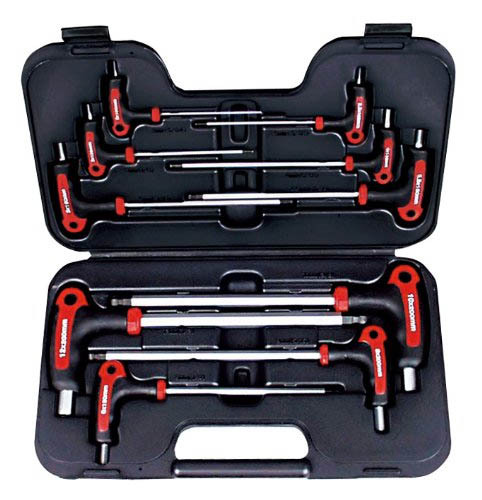 To get the Through Key, you need to buy a set OEM’d by Bondhus to Park Tools (they cater to bicycle mechanics). We go over the Ball End version below–it’s more money and not as well-loved by the reviewers. Go figure. My conclusion after seeing what the reviewers disliked was that if I wanted the Bondhus T-Handles, I’d pay the little extra for the Ball End models. This is a good-looking set to my eye: ergonomic grips and through keys on the handles. While they have a through key, they are, like the Bondhus, not ball-end. You can pay more for the ball-ends, but I don’t review them here because there were no reviews at all on Amazon of them. It’ll cost you another roughly $20-$30 to have that upgrade. They’re also one size short compared to most of the other Torx sets reviewed here. Klein has a great name and did well in our World’s Best Screwdriver round up, but the high prices and somewhat lower star ratings make me think they’re not the best choice for a T-Handle. You can get the German-made Wiha’s for not that much more and they’re much more highly rated. 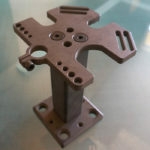 Ends twisted round too easily on small sizes. Accidentally got a mixed set with a few ball ends. See the section above for regular Bundus hex keys–these are the same except they have Ball Ends, cost more, and are not as well reviewed by users. They don’t cost a lot more, about $12. What the folks driving down the star ratings had to say was that the smaller 3 sizes were not ball ends, which annoyed them. This is actually pretty common for hex keys though, so I tend to want to ignore them. If I wanted a Bondjus set, this is the one I’d go for in order to get the Ball Ends. There you have it–4 brands you may not have been aware of that should be considered for the title, “World’s Best T-Handled Hex Key.” The choice from here is a matter of your personal taste. Personally, I am really drawn to the Ampro set if cost were no object. They have all the features, I love the fitted cases, and seem like the ones for “World’s Best.” But these others are all a cut above. 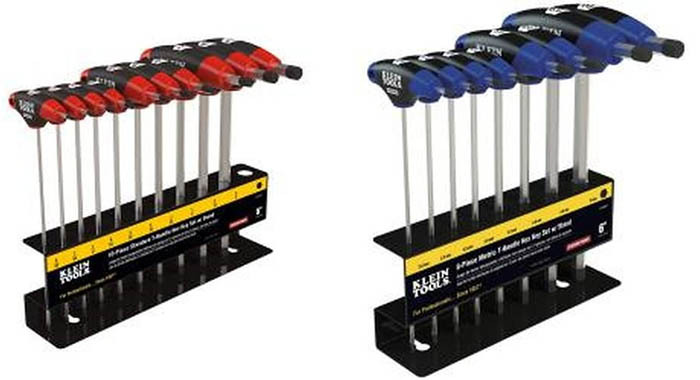 Which of these would you pick, or what brand not mentioned would you recommend for World’s Best T-Handled Hex Key? Tell us in the comments below. Note: Many of the links in this article are affiliate links to Amazon. 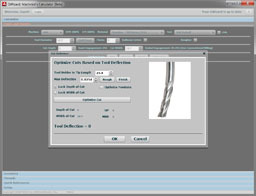 If you click through on them and subsequently purchase the tools, CNCCookbook will get a small fee. Hey, we need good tools here too, and that’s how we’re starting a fund to buy them. But, if you don’t want to contribute, no worries. Just search Amazon using the information provided here and you’ll be able to find the same thing, sans affiliate link, in no time. Use ball ends for light to medium torque applications only. Rex, the “Through Key” is a “Through Handle Key”. It sticks out the side of the T-Handle instead of the bottom. It gives you a little different reach profile and in the case of ballnosed drivers, it is typically not a ballnose. It mimics the shorter end of a typical “L-shaped” allen key. Nice feature to have on your T-Handles. Personally I’m looking for a set for bicycle work, and the thing that baffles my mind is that so many push hard at the ball end one’s. I’ve worked at a bicycle shop for a little while now, and quite frankly I shy the ball end one’s like the plague, cause they lack precision, and I hardly ever need them. 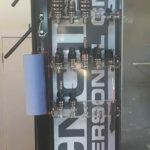 I’d never get a ball end set for a main run ‘n gun tool set – ONLY as a back up set. I also agree with you that it should be used with care/caution. Personally I will get a set of each, but 95% of the time I’ll be using the fixed end one’s. Thought it would be worth adding the mcmaster-carr t-handle hex keys. 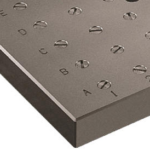 They are unique because a replaceable hex bit is inserted at the end and locked in place with a set screw. This virtually eliminates the issue of smaller bits twisting and breaking. They do occasionally have clearance issues from having wider shafts. Also at 140-160 dollars for a set of 7, they come at a premium. Maybe i missed it – What is a “Through key”? What I would like to see is some oversized hex keys for aid in removing screws in products that used WH tolerance screws during manufacture. Bob, in all your research did you ever find hex drivers with a screwdriver handle? I’m not talking about those sets of hex bits with a single magnetic screwdriver. I have a number of hex drive machine screws that I need to remove/replace often, and they sometimes jam just enough that the drive bit overcomes the magnetic force and stays in the screw. Really puts a hurt on productivity. I’ve had no problem finding Torx screwdriver sets but for some reason no hex screwdrivers. You’d think there would be similar demand. I have a set of hex drivers from the 70’s that were made by Hunter Tools that was later absorbed by Excelite. I imagine that they continued production of them. Have you ever tried a 2″ hex driver bit for a 1/4″ hex impact wrench or pnumatic power screwdriver? You can by most distributors like Ivy Classic, EZ Power, Vermont America and mny others. There are also screwdriver handles with ball lock chucks for those bits also. The bits won’t pull out of them. Also many torx sizes will work with allen head screws. I have sacrificed many torx bits for the removal of stripped allen head cap screws. usually the cap screws thst stip out have soft heads. You can take a torxs bit that is a size larger than would go in a allen head bolt and grind the top of the splines flat and sharp. Grind the tip flat and sharp a hammer broach it into the stripped head. I have also done the same for broken bolts in smaller sizes by selecting the right size drill.